Research suggests that chronic adrenal insufficiency, more commonly known as Addison’s disease, may be responsible for psychiatric symptoms in those who suffer with it. Unfortunately, these symptoms are poorly understood and inadequately studied. In one case, a 41-year-old construction worker was admitted to a psychiatric clinic complaining of depression. He had trouble sleeping and concentrating and had lost 6 pounds due to a loss of appetite. He was placed on 20mg of fluoxetine but returned 2 weeks later complaining that the therapy did not work, and even reported hallucinating his ex-wife, who had recently died in a car accident. He returned again later 4 months later and was found to have a weak pulse, major hypotension, and hyponatremia and hyperkalemia. It was at this point that he was diagnosed with Addison’s disease. The disease was first described by Thomas Addison in the mddle of the 19th century. 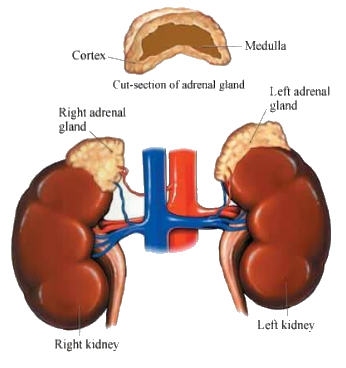 It involves inadequate secretion from the adrenal glands, leading to lower secretion of glucocorticoids. Its usual symptom pigmentation involves fatigue, weight loss, nausea, vomiting, weakness and abdominal pain. Among its psychiatric symptoms are psychosis and delirium.